WINSTON-SALEM, N.C. (AP) Florida State’s young quarterback had struggled much of the day. And the winless Seminoles – dinged up with injuries and struggling to keep Wake Forest’s defensive front out of the backfield – were on the edge of adding to a month’s worth of misery. Instead, they finally figured a way out. James Blackman connected with Auden Tate on a 40-yard touchdown throw with 53 seconds left, helping Florida State rally past Wake Forest 26-19 on Saturday for its first win. It wasn’t a performance in line with the preseason expectations that had FSU starting the year as the nation’s No. 3-ranked team and the Atlantic Coast Conference favorite. FSU coach Jimbo Fisher didn’t care, either, calling it ”just the next step” for a team that desperately needed to take one. Blackman – the freshman pressed into a starting role due to injury earlier this year – had thrown for just 81 yards entering that final drive for the Seminoles (1-2, 1-1 ACC). But after the FSU defense forced a three-and-out, Blackman was perfect with the downfield shot to Tate – who caught the ball despite a pass-interference penalty by defender Amari Henderson as well as a shoulder injury that had Tate in and out of the lineup. FSU was 0-2 for the first time since 1989. ”Just got to find a way, man, no matter what it is,” said Jacques Patrick, who ran for 120 yards and a score for FSU. 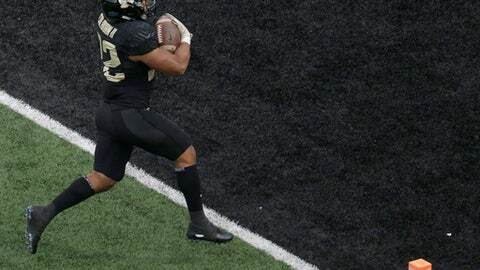 Wake Forest (4-1, 1-1) had a final chance to tie, but John Wolford’s desperation heave to the end zone for Scotty Washington fell incomplete to end it. FSU: The Seminoles closed a tough first month, from the crushing opener against top-ranked Alabama that included a season-ending injury to starting quarterback Deondre Francois to an altered schedule following Hurricane Irma that had limited them to just two games. Things didn’t look promising when the Seminoles had a flag negate a game-opening kickoff return for a touchdown, but they’re headed into October with a chance to regain their footing. ”Now after that bad 0-2 start, it kind of gives us a clean slate to build on,” said Tate, who had his left arm in a sling afterward. Wake Forest: The Demon Deacons were trying to reach 5-0 for the first time since its unexpected ACC championship run in 2006. Their defensive front gave FSU fits, but the Demon Deacons struggled to run the ball and just made too many mistakes – most notably losing two turnovers after committing just one through the first four games and giving up a big kickoff return to set up FSU’s first touchdown. Blackman had another big fourth-quarter throw, a 43-yarder down the left sideline to Keith Gavin on a third-and-20. That ultimately set up Ricky Aguayo’s 35-yard kick to tie it at 19 with 6:20 left. He threw for 7 yards on 5-for-7 passing in the entire first half, but finished the game at 121 yards on 11-for-21 passing. Wake Forest outgained Florida State by nearly 100 yards (367-270), finished with five sacks and had 17 tackles for loss. ”I felt like we outplayed them,” said Wolford, who threw for 271 yards. FSU: The Seminoles host No. 14 Miami on Oct. 7 in a game rescheduled due to Hurricane Irma. Wake Forest: The Demon Deacons visit second-ranked and reigning national champion Clemson on Oct. 7.